Catherine Ryan Hyde Catherine Ryan Hyde is the author of more than 25 published and forthcoming books, including the bestselling When I found You, Pay It Forward, Don't Let Me Go, and Take Me With You. "Don't Let Me Go" Scene Adaptation! 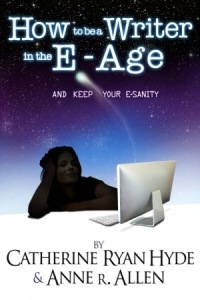 A few words about my newest release, the nonfiction help book for writers How to be a Writer in the E-Age...and Keep Your E-Sanity!, which I co-authored with friend, fiction author and publishing industry blogger Anne R. Allen. I've noticed it's important to be clear about a book such as this one. What it is, and what it is not. Most important, though it is chock-full of information on digital publishing, it is not a book about how to self-publish. It covers a much broader spectrum of new publishing models. The scope is so broad, in fact, that I doubt I will be able to paraphrase it all in this blog post. I think if you're curious about the book, and think you might benefit from it, you should click on the link to its Amazon page, and then click Look Inside. And read the table of contents. You might be surprised. This isn’t a book about how to write, although we’ve got some great secrets for self-editing and how to construct an opener that will grab readers. It’s also not a book on how to get published, although we have tons of info on how to find the right agent and how to write an e-query, as well as find publishers who don’t require an agent. It’s not a book on how to self-publish, although we provide the information to help you do that and decide if that’s the route you want to take. It’s not a book about building platform, although it includes my whole step-by-step “how to blog” series and tons of info on how to use Twitter, Goodreads, Pinterest and other social media sites. It is a book about how to BE a writer. How to take care of yourself and your muse; how to make sense of criticism; how to build platform without giving up too much of your writing time, and much, much more. I hope that works to narrow down whether this book would help you. Though I have another simple litmus test: Are you a writer? This book will probably help you. Have You Seen Luis Velez? My "LUIS VELEZ is Here" Giveaway! HAVE YOU SEEN LUIS VELEZ? is here--in ARC form! JUST AFTER MIDNIGHT is Here--and it's on Prime Reading! Please check your inbox for a confirmation message. Once confirmed you will receive blog posts via email within a day of when they are published. I will never share your email address. When you start tweeting "You can't impeach me!" I think it's a sign that you're having a bad presidency. Copyright 2009-2019 by Catherine Ryan-Hyde.